John Webb was born in Sutton in 1883, he was the fourth child of John and Susan Webb, although their first child died only a few months old. He was tower captain at Benhilton from about 1903, and his death seems to have dealt a major blow to ringing there. John Webb (sr) married Susan Lusher at St Leonard’s, Streatham on 25 February 1871. They were both living in Balham, John was 28 and a gardener, Susan 32. By the time of the 1871 census a month later, they were living together at 6 Albert Terrace, Kate Street, Balham. Four other people in a separate household were living at the same address. William Sharman Webb was born on 24 July 1872, but was buried at West Norwood Cemetery on 25 October, aged just three months. Elizabeth Mary Webb was born on 6 February 1874, and Thomas Sharman Webb on 30 December 1876. All the first three children were baptised at St Mary’s, Balham. By the 1881 census on 3 April the family were living at 16 Kate Street, Balham. Susan’s sister-in-law, Sarah (45, a widow), was visiting, and they had a lodger, Walter Watts (25) – like John Webb he was a gardener. Elizabeth (7) and Thomas (4) are both listed as scholars. The family must have moved soon after, as by the time of John Webb’s own birth in 1883 they were in Sutton. 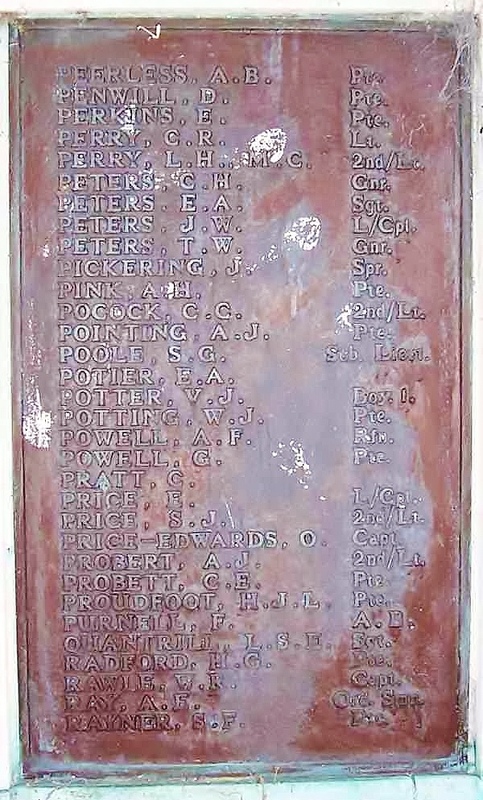 Two John Webb’s were registered in the Epsom Registration District that year, in the 3rd and 4th quarters – it is not clear which is the correct one, and no baptismal entry has yet been found. By 1891, the family were living at 2 Elm Grove Cottages, Sutton. John Webb sr (47) was still a gardener, and Susan was now 52. Elizabeth was now 17, but has no occupation listed; Thomas was 14 and already working as a gardener’s boy, perhaps with his father. John jr was seven and still at school. The first record of any member of the family ringing is the report of a T S Webb, presumably Thomas Sharman Webb, ringing the third to a 720 of Plain Bob Minor at Benhilton on 12 February 1893, though this seems to be the only time he’s reported as a ringer. It’s not clear how quickly John jr followed in his footsteps. In 1900 Elizabeth married William Thomas Thurley, by 1901 they were living at 2 East Terrace, Crayford Road, Erith, Kent, and William (25) was a stationary engine driver on a coal wharf. 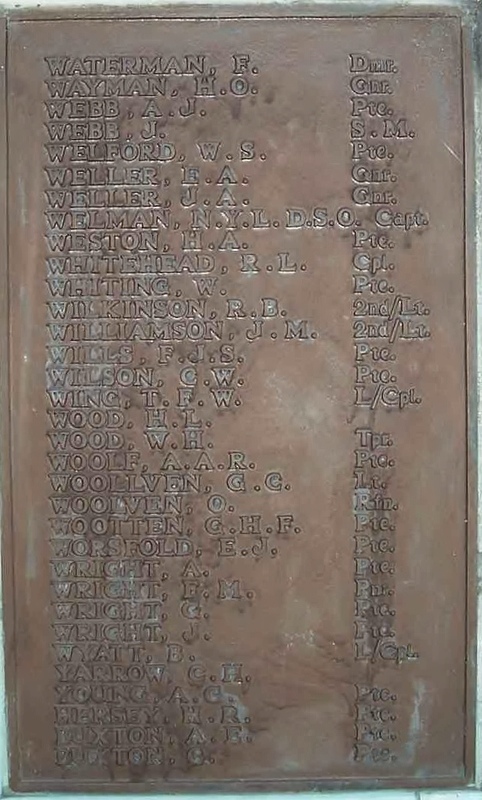 Thomas Webb had also moved away, he was working at the Royal Small Arms Factory, Enfield Lock (manufacturer of the Lee-Enfield rifle which equipped the British Army throughout the First World War), and lodging with the Dudley family at 34 Hanby Terrace. In 1901 to the John Webb’s, father now 56 and still a gardener, son 17 and working for a corn merchant. Susan was now 62. All three were living at 2 Ingleside Villas, Brandon Road, Sutton. John Webb jr had certainly learnt to ring before 1903, as sometime around then he was appointed tower captain and steeple keeper. Presumably he was ringing regularly for Sunday service at Benhilton, but much of his early serious ringing seems to have actually taken place at neighbouring Carshalton. The earliest peal he rang so far identified (it is not marked as his first peal) was at Carshalton on 9 December 1903 when he rang the fifth to a peal of Grandsire Triples. This was followed by a peal of Oxford Bob triples on 24 August 1904 (on the fourth), again at Carshalton. On 7 February 1906 he conducted his first peal, at Carshalton again, ringing the second to Grandsire Triples. This was also the first peal of the two Rayner brothers, Sidney and George (and possibly also the middle brother, Henry), I failed to identify this peal when researching the two brothers, but it has now been added to their respective pages. 1907 also saw a single peal, again at Carshalton. Webb does not seem to have rung any peals in 1908 (or at least not at Carshalton or Benhilton), but 1909 saw four. The first two, on 19 January and 10 February were at Carshalton, but the second pair, on 10 November and 14 December were on home turf at Benhilton. On 2 April 1911 the family of the two John Webbs, and Susan were still living at 2 Ingleside Villas. John Webb sr is still a jobbing gardener, though his age is now given as 71 – this is inconsistent with earlier censuses, it would be expected to see him listed as 66 or 67. Susan was now 72. John Webb jr (27) is described as a manager and corn merchant in a corn merchant’s firm. The succeeding years saw a variety of further ringing, mostly at Benhilton itself now. There are also signs of an increasing connection with the Mitcham ringers with the names of Albert Carver, William Joiner and Benjamin Morris, all listed on the original roll as Mitcham men appearing along with Benhilton locals such as the Rayner brothers. In April 1914 Webb was presented with gifts from the vicar and churchwardens and the ringers in appreciation of his services as tower captain and steeple keeper over the past eleven years, and to mark his impending wedding. The gifts made up a complete set of fireplace tools, so were obviously intended to help set up a cosy new married life. It was on 18 April 1914 that John Webb (30) married Jane Eliza Bullen (33) at St Matthew’s, Surbiton. Webb’s address is given as 2 Ingleside Villas once more, and his occupation is given as corn merchant. No occupation is listed for Jane, at the time of the wedding her address is given as 1 Woodside Villas, Dennan Road, Surbiton. Her father, Daniel, was a carpenter. In 1911 she appears to have been working as a cook for the Colegate sisters at Earlywood, Albion Road, Carshalton. Just over a month later, on 24 May 1914, the Benhilton ringers rang another quarter peal. John Webb conducted from the seventh. The peal was for Empire Day, but also marked the birthday of Jane, and the wife of F Ford, another of the ringers. Even after the outbreak of war ringing carried on with a peal of Grandsire Triples. Webb rang the sixth, George Rayner the fifth, and J Howard R Freeborn the seventh. Freeborn is not listed among the Benhilton ringers on the roll, but my current research shows he did indeed serve. Then on 31 October 1915 was a quarter peal of Stedman Triples at Benhilton. This also included Alfred Winch of Leatherhead and W H Joiner of Mitcham. They had been intending to ring London Surprise Major, but something went wrong in the arrangements and they didn’t have enough who knew the method. On 10 November he did get his quarter peal of London, though it was rung at Mitcham. The band also included D W Drewett of Mitcham who would also be killed during the war. It was the first quarter peal in the method by seven of the band, the only exception being A J Perkins of Mitcham. On 26 October 1916 Webb was called up. He had probably gone through the enlistement formalities some time previously at Kingston-on-Thames, but the surviving two pages of his service record do not show the date of that. He was medically inspected at the Army Service Corps depot at Grove Park. He had indicated a preference for service with the forage department of the ASC (which of course fitted with his civilian occupation), forage was still a vital part of the army’s logistic support, with much transport, and many guns, still relying on literal horse power, and of course there was still mounted cavalry. Over the course of the war, the weight of forage shipped to France actually slightly exceeded the weight of munitions. However, the army was increasingly mechanising, and Webb was actually assigned as a motor transport learner, indicated explicitly on his service record, and also implied by the prefix of his service number, DM2/228893. Unfortunately only two pages of his record survive, and they are quite badly damaged. Of the medical information all that is readable is his height (and even that is unclear), which appears to be 5’8.75″. No information is given on his postings, so all we know is that at the time of his death he was serving with Q Motor Transport Company in Kent. Given that he had managerial experience in civilian life, and had been running the band at Benhilton from about the age of 19, it is perhaps no great surprise that in the just over two years he was in the army he rose from driver to company serjeant major. Webb seems to have been caught up in the first great wave of Spanish Flu. His obituary in The Ringing World tells us he died of double pneumonia on 28 November 1918 following influenza, and the CWGC cemetery register also records his eath as being due to pneumonia. The funeral was at Benhilton on Wednesday 4 December, and he was interred as close to the tower as could be managed. Before and after the funeral ringers from Benhilton, Mitcham, Beddington and Carshalton (Captain Freeborn, F Ford, A J Perkins, A Boxall, C Dean, C Bance, F Holder and W Joiner) rang touches of Stedman and Grandsire Triples (conducted by Freeborn, Holder and Perkins). Ford (1-2), Freeborn (3-4), Perkins (5-6) and Joiner (7-8) rang a course of Grandsire Triples over the open grave on handbells. In the evening a touch of 500 Grandsire Triples was rung by J Lambert (conductor), E Walker, W Joiner, F Ford, A Calver, W Smith, L Ferridge and A Bundle. The following Monday, 9 December, the bells were rung half-muffled to a 720 of Bob Minor with 7 and 8 being rung behind as covers by A Boxall, W Smith, J A Lambert, A Mason, A Calver, F Ford, Captain Freeborn and W Hodges. The obituary was written by “A J P”: probably A J Perkins. He describes Webb as the “leading light of the Benhilton (Sutton, Surrey), ringers”, and “an enthusiast”. Perkins explains how he helped Webb to learn the calling for Holt’s Original peal of Grandsire Triples, and that he had no doubt that Webb would have rung a peal of London but for the war, at the time it seems to have been near the pinnacle of ambition for ringers to have called Holt’s Original, and rung a peal of London. As described in the previous post on the Rayner brothers without Webb the band at Benhilton continued for a little while after the war, but then the bells fell virtually silent until they were rehung in 1929. One suspects that Webb would have kept the bells in better ringing order, or would have arranged for rehanging much sooner, given what seems to have been a very energetic character. This entry was posted in Benhilton, November, People, Q Motor Transport Company and tagged Bellringing, Benhilton, First World War, John Webb on 10/09/2013 by davidunderdown95.